By Daniel G. Driscoll, Rodney E. Southard, Todd A. Koenig, David A. Bender, and Robert R. Holmes, Jr.
During 2011, excess precipitation resulted in widespread flooding in the Central United States with 33 fatalities and approximately $4.2 billion in damages reported in the Red River of the North, Souris, and Mississippi River Basins. At different times from late February 2011 through September 2011, various rivers in these basins had major flooding, with some locations having multiple rounds of flooding. 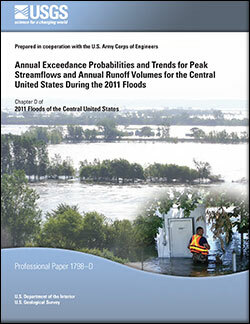 This report provides broadscale characterizations of annual exceedance probabilities and trends for peak streamflows and annual runoff volumes for selected streamgages in the Central United States in areas affected by 2011 flooding. Annual exceedance probabilities (AEPs) were analyzed for 321 streamgages for annual peak streamflow and for 211 streamgages for annual runoff volume. Some of the most exceptional flooding was for the Souris River Basin, where of 11 streamgages considered for AEP analysis of peak streamflow, flood peaks in 2011 exceeded the next largest peak of record by at least double for 6 of the longest-term streamgages (75 to 108 years of peak-flow record). AEPs for these six streamgages were less than 1 percent. AEPs for 2011 runoff volumes were less than 1 percent for all seven Souris River streamgages considered for AEP analysis. Magnitudes of 2011 runoff volumes exceeded previous maxima by double or more for 5 of the 7 streamgages (record lengths 52 to 108 years). For the Red River of the North Basin, AEPs for 2011 runoff volumes were exceptional, with two streamgages having AEPs less than 0.2 percent, five streamgages in the range of 0.2 to 1 percent, and four streamgages in the range of 1 to 2 percent. Magnitudes of 2011 runoff volumes also were exceptional, with all 11 of the aforementioned streamgages eclipsing previous long-term (62 to 110 years) annual maxima by about one-third or more. AEPs for peak streamflows in the upper Mississippi River Basin were not exceptional, with no AEPs less than 1 percent. AEPs for annual runoff volumes indicated less frequent recurrence, with 11 streamgages having AEPs of less than 1 percent. The 2011 runoff volume for streamgage 05331000 (at Saint Paul, Minnesota) exceeded the previous record (112 years of record) by about 24 percent. An especially newsworthy feature was prolonged flooding along the main stem of the Missouri River downstream from Garrison Dam (located upstream from Bismarck, North Dakota) and extending downstream throughout the length of the Missouri River. The 2011 runoff volume for streamgage 06342500 (at Bismarck) exceeded the previous (1975) maximum by about 50 percent, with an associated AEP in the range of 0.2 to 1 percent. In the Ohio River Basin, peak-streamflow AEPs were less than 2 percent for only four streamgages. Runoff-volume AEPs were less than 2 percent for only three streamgages. Along the lower Mississippi River, the largest streamflow peak in 91 years was recorded for streamgage 07289000 (at Vicksburg, Mississippi), with an associated AEP of 0.8 percent. Trends in peak streamflow were analyzed for 98 streamgages, with 67 streamgages having upward trends, 31 with downward trends, and zero with no trend. Trends in annual runoff volume were analyzed for 182 streamgages, with 145 streamgages having upward trends, 36 with downward trends, and 1 with no trend. The trend analyses used descriptive methods that did not include measures of statistical significance. A dichotomous spatial distribution in trends was apparent for both peak streamflow and annual runoff volume, with a small number of streamgages in the northwestern part of the study area having downward trends and most streamgages in the eastern part of the study area having upward trends. Driscoll, D.G., Southard, R.E., Koenig, T.A., Bender, D.A., and Holmes, R.R., Jr., 2014, Annual exceedance probabilities and trends for peak streamflows and annual runoff volumes for the Central United States during the 2011 floods: U.S. Geological Survey Professional Paper 1798–D, 89 p., https://dx.doi.org/10.3133/pp1798D.